The Layers menu gives access to common and some additional functionality that is not available elsewhere. The Flatten menu item will merge all the layers together. 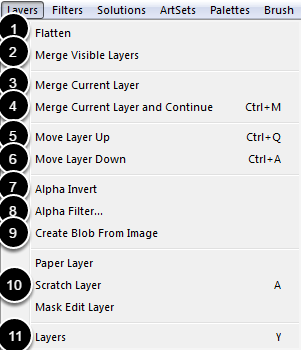 The Merge Visible Layers menu item is similar to Flatten however layers that are hidden will not be merged. The Merge Current Layer menu item will merge the currently selected layer with the layer below. The Merge Current Layer and Continue is like merge but the currently selected layer will not be removed. This can be useful in cases where you are doing actions that you want to merge to another layer one at a time. The Move Layer Up will move the currently selected layer up, swapping positions with the layer above. The Move Layer Down will move the currently selected layer down, swapping positions with the layer below. The Alpha Invert menu item will invert the alpha channel. What was transparent will now be opaque. The Alpha Filter menu item allows you to apply any of the standard filters and have them applied to just the alpha channel. Create Blob From Image menu item is a very specialized option. It will convert the luminance values of the current layer image data into data for use with the Blob brushes. These allow access to the special layers. See the Special Layers section for more details. This will toggle the Layers panel.